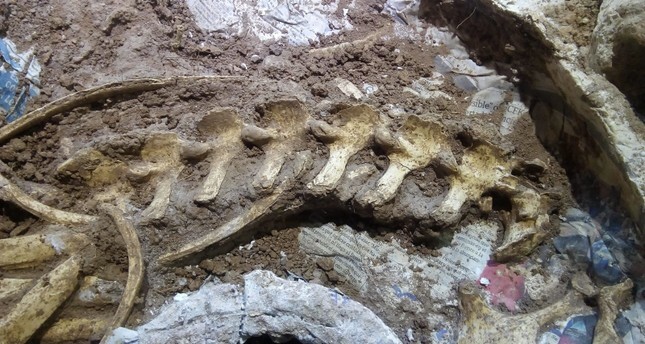 The well-preserved fossil of a prehistoric deer has been discovered just to the north of Buenos Aires, the La Matanza University revealed on Monday. The fossil -- which hasn't yet been given a definitive age -- included almost 70 percent of the animal, including its spine, extremities and teeth. The discovery came from a site where 24 fossils of mammals and reptiles have been found in the last 17 years. "It's amazing to see how its spine and neck remained in the 'life position'," said Jose Luis Aguilar, director of the Paleontological Museum of San Pedro, in the north of Buenos Aires province. As well as an almost complete set of teeth and its spine, the skeleton also included more than 20 ribs, the pelvic bone, a rear leg and a part of a femur. This species of deer, from the Morenelaphus genus of which only fragmentary remains had been found until now, could reach up to 200 kilograms (440 pounds). "This little animal has come to give us details about a moment in our prehistory when the environment they lived in was quite different to now," said Aguilar, who made the discovery. Tests are due to be carried out to determine the fossil's age but the Morenelaphus is from the Pleistocene era that lasted from 2.5 million years ago until around 12,000 years ago.